The hot spring sentiment which several Ryokans of a historied wooden structure were built in the sloping ground of the in a mountain, and located in a line and was countrified is an enough.Spring quality has a smooth feeling to the skin gently, and is called the beauty's hot spring.At a brand-new Uchi-yu, a foam sticks, so that it is wonderful, and although it is tepid, it often gets warm repeatedly in about 15 minutes.There are many people who say, "A hot-spring cure will adapt itself to the skin from the 3rd", and visit to rest. 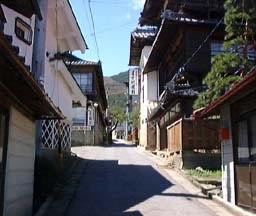 He is Miyama who surrounds Aoki-mura.Natural woodland mountain climbing and a trekking are popular in a broad age layer. 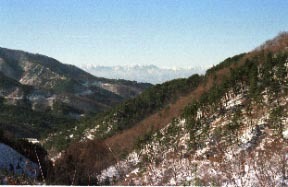 The view of the Aoki Pass to a Japanese North Alps. 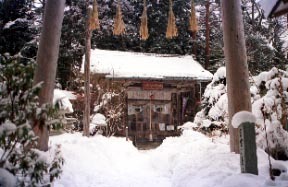 The back of the Yasumiya shrine has a stone statue of the Buddha of the rich expression of 860 bodies.It is also recommendation to walk along a Shunara Pass, although it can go also by car to a shrine.About 800M15 minutes after a gateway at the entrance to a Shinto shrine.